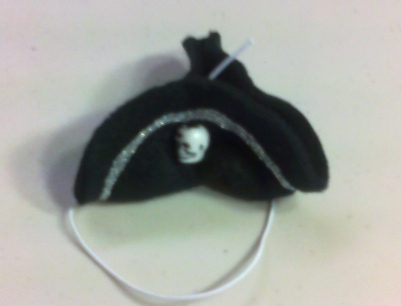 HOW ABOUT A LITTLE PIRATE HAT FOR YOUR FAVORITE GUINEA PIG???? The hat stays on the animal's head with adjustable elastic. I left the elastic long so that you can move the knot to fit your animals. You can also color the elastic with permanent marker to darken it for darker colored pet. PLEASE NOTE: Here at Marna's Menagerie we only charge shipping on one item, no matter how many you purchase, so shop away. You largest item will determine the cost of shipping. ALL THE USA MADE HAND CRAFTED ITEMS YOU PURCHASE FROM US, THE MONEY GOES TO CARE FOR OUR ANIMALS HERE IN NW SD. MANY COULD BE CALLED "RESCUES" BUT WE JUST CALL THEM OURS. WE APPRECIATE YOUR BUSINESS. These items are new and have never been worn by or tried on by any other animals. 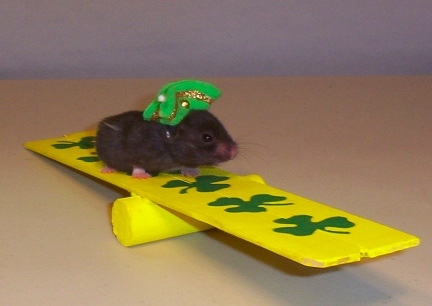 This is a photo of my own hamster, Coal, wearing his own hat. It is not the hat that is for sale. WE ONLY EXCEPT PAYPAL PAYMENTS. HOWEVER! PAYPAL IS MORE THAN HAPPY TO EXCEPT YOUR CREDIT CARD OR PERSONAL CHECK. WE ONLY SHIP TO THE PAYPAL ACCOUNT ADDRESS THAT PAID FOR THE ORDER. This smaller item has a smaller shipping charge of $1.78 to the USA when shipped with similar items. Your shopping cart will show your shipping costs and total based on the items in it. When you hold a gerbil you are holding a small life in your hands, please respect that life and care for it properly.